HOW MUCH DO PHONE WORDS COST TO LICENSE / BUY? 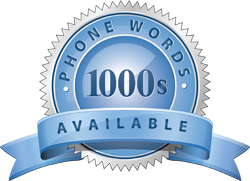 Your investment in licensing or acquiring a Phone Word is directly related to the value and benefits that can be obtained from your Phone Word. As such, if you select anything else other than the most relevant, ‘easy to remember’, ultimate Phone Word, people will not remember it and you will not get the results you want. Monthly license fees and acquisition costs vary significantly, depending on the specific Phone Word you’re after. To obtain a price, please contact us today.